LiveU uplink for Panasonic P2 cam AG-HPX600. 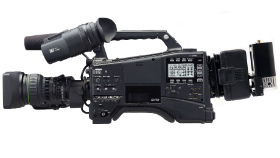 Osaka, Japan (February 6, 2013) – Panasonic has introduced its exclusive AG-SFU603G software upgrade key for its P2 cam AG-HPX600 to expand its functionality. *1 The solution combines LiveU’s live video uplink technology with the latest Panasonic broadcast equipment to deliver the first available integrated live camera solution. The AG-SFU603G software upgrade key integrates LiveU’s LU40 *2 portable lightweight uplink solutions with the "P2HD" series of Panasonic’s new AG-HPX600 HD camera recorder. The expanded functionality can be activated via the software key after installation of the software upgrade; the upgrade is being released simultaneously on the AG-HPX600 camera. LiveU’s LU40 unit and the AG-HPX600 are interconnected via the SDI and USB. Live camera video (HD/SD signals) can be transmitted through up to six connections via the LU40. This upgrade will allow the uplink ‘start-and-stop’ to be controlled from the AG-HPX600 and the LU40 status to be displayed on the AG-HPX600 viewfinder, enabling camera operators to relay live video securely. An optional upgrade system has been introduced in the AG-HPX600 P2 camera recorder so that only necessary functions, such as an Internet connection (AG-SFU601G) and VFR recording (AG-SFU602G), etc., are installed. Following this latest AG-SFU603G upgrade, other innovative technologies, such as "microP2 card," "AVC-ULTRA codec" will also be supported. Starting with the LiveU collaboration, Panasonic will strengthen its partnerships with various companies providing uplink solutions to offer customers new ways of operation based on the P2 camera recorders' network capability. The AG-SFU603G software upgrade key will be available in February at a suggested list price of ￥31,500 in Japan.